Antisocial personality disorder (ASPD) is described by the American Psychiatric Association’s Diagnostic and Statistical Manual, fourth edition (DSM-IV-TR), as an Axis II personality disorder characterized by “…a pervasive pattern of disregard for, and violation of, the rights of others that begins in childhood or early adolescence and continues into adulthood.” A complete lack of empathy coupled with a lack of humanity is very common in about one-third of the prison population. It is also common in about one out of ten Wall Street bankers. 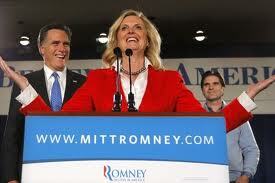 The issue isn’t whether Willard “Mitt” Romney has broken the law, as he excels at covering his tracks. It’s the countless displays of this ASPD. In this era, cutting off a gay kid’s hair would be a hate crime. Impersonating an officer would be considered a criminal offense, exhibiting a strange fetish for authority and control. Unfortunately, many people confuse his wealth, nice clothes and apparent regular guy-if-awkward characteristics with decency. They don’t seem to have a clarified way of seeing him. So THEY are what puts us all in danger. Those of us whose hair stands up on the back of our necks at the mere sight of him have good reason. He is undoubtedly unable or unconcerned with discerning the truth from fiction. Saying he has a “god complex” would not be hyperbole. Even if you’re engaging in “hi jinx” (as Romney often says) as an adolescent, knowingly walking a blind teacher into a glass door is beyond a prank; it is simply deviant and cruel. To be able to look moderator and accomplished professional, Jim Lehrer in the face, state that you will be dismantling and abolishing the company that has employed him for over thirty-five years and smile while saying, “I like you too,” is beyond unnerving, it’s downright creepy. His perverted worldview is rampant with a sense of entitlement and callousness that should give anyone pause. It’s rather amusing how he requires the occasional anecdote from his past to “humanize” him. President Obama and Vice President Biden exude empathy and humanity. The absence of such qualities are frightening. Running for office requires a degree of narcissism that is perhaps more predominant than that in the general population. The MMPI 2 attributes excessive narcissism, to say the least, to a grandiose sense of entitlement with dramatic displays of one’s accomplishments. This Grandiosity-Exhibitionism factor predicted “a consistent behavioral pattern of self-assuredness, aggressiveness, exhibitionism, self-indulgence, and disrespect for the needs of others.” The simple fact that his equally entitled spouse, Ann Romney, has actually said the words, “It’s Mitt’s time, it’s our turn now” demonstrates a gross sense of self-importance, eerily similar to the elevated sense of self-esteem exhibited by a toddler. When Paul Ryan and other surrogates say “Mitt’s uniquely qualified,” one must assume that is indeed what Willard believes. He is the chosen one, because the Mormons view themselves as “God’s Chosen People”, so given the fact that Willard is thoroughly indoctrinated into this cult, it is only natural he should show an elevated degree of narcissism and entitlement. ASPD is characterized largely by these traits. If you have any doubt of Romney’s narcissism, simply look at this Mayo Clinic definition and notice how he satisfies every single criteria. Mitt is the perfect manifestation of his religion, whose adherents control much more of the food supply, finance, fuel and industry than most Americans realize. The largest cattle ranch in the nation and a great deal of land is owned by the Mormons in the state of Florida, thus controlling the means of livestock production. Another alarming fact is the close relation of the GMO company Monsanto and the venture (a.k.a. vulture) capitalist firm Bain Capital, enabling LDS control of seed and crop production in America. Their ambitions know no limit. It is considered virtuous for a Mormon to acquire as much wealth, and do it by any means possible. Willard’s wealth makes him extremely attractive to many (not all) Mormons, which is in total conflict with the Christian virtue of poverty and humility. Simply look to the folks at the Sensata factory in Freeport, Illinois and how Willard has had some of them arrested for protesting the outsourcing of their livelihood. Where a common criminal might demonstrate disregard for others’ safety by driving recklessly, Romney does the same, but by jeopardizing people’s jobs. If more people were aware of Mitt Romney fulfilling Joseph Smith’s White Horse Prophecy, they would be far more cautious about casting a vote for this furtive narcissist. If ever there was a candidate poised to manifest the insane entitlement of the LDS faith, this is the guy. Not only is he the quintessential Mormon, he’s afflicted with ASPD. This disorder allows him, without remorse, to cut off the subsistence of Americans in need because he feels it is more important to give a tax break to his wealthy comrades. The willful ignorance of Americans to actually endorse his anti-redistributive tax ideas shows a total lack of empathy for others, like themselves, in the hopes they too will be among the filthy rich. This is how he appeals to so many for whom he has absolutely no concern. The unmitigated greed of coveting all the toys in the sandbox, like Willard, will be the end of America’s investment in our future generations and such perfidy is something none of us can afford. It would be a wonderful treat if the media would judge the second Presidential debate on the merits of truth and integrity not the audacity of deception. I’m hoping Willard is called out on his unscrupulous treachery by our President. It’s really about time someone does. Previous Post VP Biden Must Be Unleashed on Paul Ryan and His Lies! Simply put, as Jessie is so expert at doing; “It’s Mitt’s time, it’s our turn now” demonstrates a gross sense of self-importance, eerily similar to the elevated sense of self-esteem exhibited by a toddler.” This says it all, “it’s our turn now?” “It’s Mitt’s time?” Let’s see, if I remember correctly, oh yea, I do remember correctly, this is the people’s country. What you’ve witnessed in these statements is a married, indoctrinated Mormon couple. Indoctrinate: to instruct in a doctrine, principle, ideology, etc., especially to imbue with a specific partisan or biased belief or point of view. Brainwash: to effect a radical change in the ideas and beliefs of (a person). Now if you wish to brainwash and indoctrinate your morality on all of humanity, that may be interesting. The purpose of education is not to indoctrinate but to inform. Once again, Jessie calls out the enormity of Mitt Romney’s antisocial personality and the economic and cultural edevastation we would see under a Romney presidency. Also, as someone who has lived in the West my whole life, like Jessie, I’ve seen the Mormon secretive, sanctimonious attitude since high school (I’m 57). Make no mistake, this is a greedy, pervasive cult.